The Utah Quit Claim Deed will require several pieces of information to be supplied for its submission to the appropriate county recorder. The Legal Description of the Property, Names and Addresses of the Grantor and Grantee, the Monies due to the Grantor, and the Notarized Signature of the Grantor are the minimum requirements for all counties though, some may vary in both the submission requirements and the fees due. The completed form will need to be submitted to the Utah County Recorder of the same County as that of the Property. Recording – Local County Recorder’s Office (Select Your County). Signing (§ 57-3-101) – Document must be signed with a Notary Public. Water Rights Addenda (§ 57-3-109) – All quit claim deeds filed after July 1, 2011 are required to have this form attached even if there are no rights to water on the property. Step 1 – A blank Utah Quit Claim Deed may be downloaded directly from this web page. This is available through the buttons on the right (“PDF,” “ODT,” and “Word”). Select one of these buttons and save the file to your machine. Step 2 – The first page will require some initial information near the top left hand corner. This section will call for the Full Name of the Preparer on the first line and the Complete Preparer Address on the two lines below this. Finally, the last line of this section calls for the Preparer’s State and the Preparer’s Zip Code. Step 3 – The successive area (also at the top of the first page) called “After Recording Return To” will require the Address the Utah County Recorder should return materials to. Make sure the first line in this section contains the Mail Recipient Name, the second and third lines contain the Mailing Address, and the fourth line has the State and Zip Code reported. 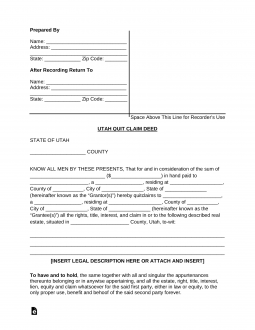 Step 7 – The Utah Quit Claim Deed will also need the Grantor’s Place of Residence reported. Do this on the blank space following the statement beginning with “residing…” Then, use the next three spaces to report the “County of,” “City of,” and “State of” the Grantor’s Place of Residence. Step 8 – The next area will require the Grantee, the individual assuming the Grantor’s Claim to the Property, be defined by entering the full Name of this entity on the line following the phrase “quitclaims to.” The word “Grantee” will also need to be input directly following this. Step 9 – The Grantee Address of Residence must also be displayed in the proper area. Enter this Address just after the statement “residing at.” The next three blank spaces have been provided so the “County of,” “City of,” and “State of” the reported Grantee Address also be displayed properly on this form. Step 10 – The final report that must be provided on this document will focus on the Property at hand. First, after the wording “…described real estate, situated in,” fill in the Name of the Utah County where the Property is physically located on the blank space provided. Step 11 – The area below the words “County, Utah, to-wit” must contain the Legal Address and Description of the Property this conveyance form is concerned with. The Legal Description may be found with the Utah County Clerk records for that land or the Title. Step 12 – The Grantor’s Signature section on the second page must be filled out in the presence of a Notary Public. In fact, there will be an area below the Signature area specifically for the purpose of notarizing this document. There will be enough spaces provided for two Grantors to fill out the Grantor Signature section, you may add more room at your discretion. The Grantor must Sign the line labeled with “Grantor’s Signature.” The Printed Name of the Grantor must be input on the line labeled “Grantor’s Name.” The Street Address of the Grantor must be reported on the line with the label “Address.” The City, State, and Zip Code of the Grantor’s Address must be entered on the line with the label “City, State & Zip.” The attending Notary Public will note the County, attending Parties as well as the Signature Date. Make sure this information is correct. The Notary Public will also provide the Notary Seal, Identification Number, and Commission Expiration. 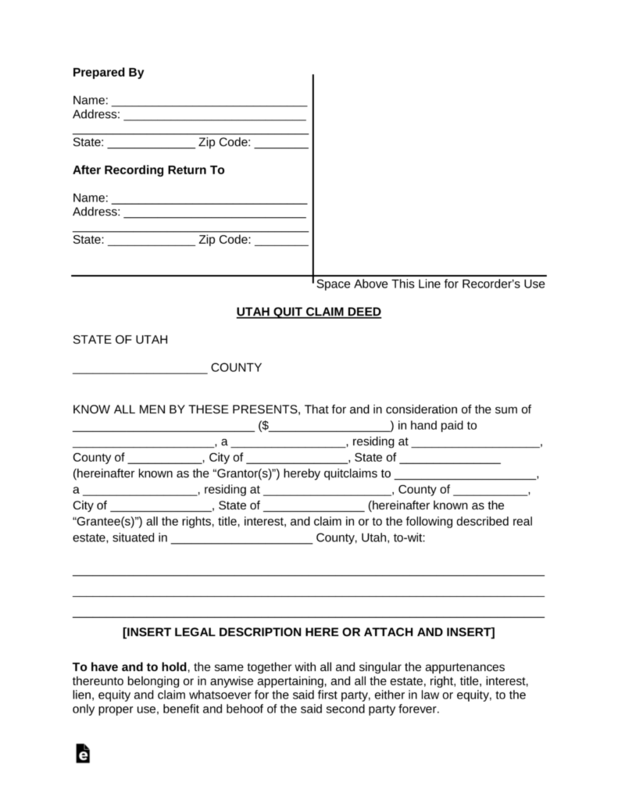 Step 13 – Contact the Utah County Recorder of the Property’s County. Utah Counties will have varying guidelines and fees beyond the basic requirements. Make sure you obtain these instructions and fees so that you may comply with the expectations of the Utah County Recorder.